Semi truck accidents are not like car accidents! Many personal injury attorneys treat a tractor trailer crash as a bigger car crash. In reality, not only are the consequences frequently more devastating than a two-car crash, a collision with a semi truck is very different legally. Proper litigation of an injured party’s claim requires an attorney who is experienced in handling 18-wheeler accidents. At M. Blake Heath, Trial Attorney LLC, our attorneys know the trucking industry, the regulations that govern it, and how the trucking companies use the law to keep them from being accountable under the law. More importantly, because of our experience in handling truck accident cases, we ask the right questions and investigate in the right areas. We help our clients hold negligent drivers and trucking companies accountable for the damage they have caused. However, an experienced truck accident lawyer knows the trucking companies’ secrets. We use our experience to fight for the families and victims of the collision. We help them recover for the injuries and death that result from the industry’s reliance on driver fatigue, inexperience, and other cut corners. As a small Kansas City law firm, the attorneys at M. Blake Heath, Trial Attorney LLC know that our clients must come first. We are compassionate and diligent professionals who leverage our extensive resources to work towards the best outcome for our clients. In general, we practice plaintiff personal injury law, including catastrophic personal injury, insurance bad faith, and product liability. If you or a loved one has been injured in a semi truck accident, contact the experienced personal injury attorneys at M. Blake Heath, Trial Attorney LLC for a free case evaluation. 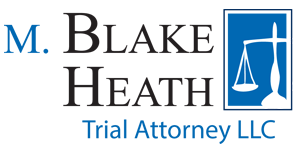 At M. Blake Heath, Trial Attorney LLC, we represent the victims of personal injury in the Kansas City, Missouri, metro area, and the counties of Jackson, Clay, Platte, Cass, Buchanan, and Johnson—including the cities of Independence, Lees Summit, Gladstone, Raytown, Blue Springs, Liberty, Grandview, St. Joseph, Platte City, Warrensburg. In addition, we will represent the victims of semi truck accidents in Kansas City, KS, and Wyandotte County.